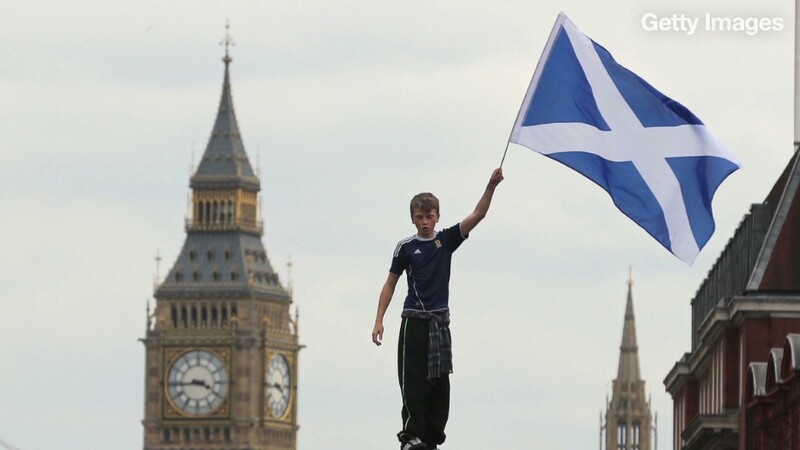 Concerns about possible independence are pushing Scottish investors to the security of gold. Data from the gold trading firm BullionVault shows orders for gold have spiked this month. Nearly 40% more Scottish residents have bought gold since the start of September compared to the same period last year. "We think it's demonstrably linked to anxieties about what may happen ... if Scotland votes for independence," said Adrian Ash, head of research at BullionVault. Polls are showing voters are split roughly 50-50, and there's plenty of uncertainty about what would happen if the vote leads to independence. Experts forecast that if Scottish voters opt to leave the United Kingdom and form an independent nation, there would be major short-term disruptions to the U.K. and Scottish economies as politicians hash-out a deal on separation. Even though the referendum is just hours away, there's still no agreement on what currency Scotland may use if it breaks away -- giving investors extra reason to move out of cash and into gold as the value of the pound has taken a hit. Meanwhile, some investors are opting to move their money out of Scotland altogether as rumors spread that a newly independent Scottish government could try to control asset flows. Haig Bathgate, the chief investment officer at the Edinburgh-based law and asset management firm, Turcan Connell, said his clients are increasingly calling in to discuss moving their money out of Scottish accounts. "As you might expect, some clients are getting slightly apprehensive," he said, noting that his firm has moved assets out of Scotland for a variety of customers. However, Bathgate said capital control concerns are unfounded since Scotland will not become independent immediately following the referendum. If voters opt to leave the United Kingdom, the split will not be official until March 2016. Until then, Scotland will still be part of the union and operating under its rules.